As a result of the merger between the Eurocopter parents French Aerospatiale-Matra, the German DaimlerChrysler Aerospace (DASA) and the Spanish CASA companies in July 2000, the Eurocopter group became a division of the new formed EADS (European Aeronautic Defence and Space Company). Taking off into 2014, the EADS group has been rebranded as "Airbus Group". Uniting all its activities under a single brand, Airbus Group also renamed its helicopter division Eurocopter, that was rebranded Airbus Helicopters on 8 January 2014. Eurocopter Germany used test-registration D-HECX for the 2009-built Eurocopter EC135 P2+ c/n 0786. 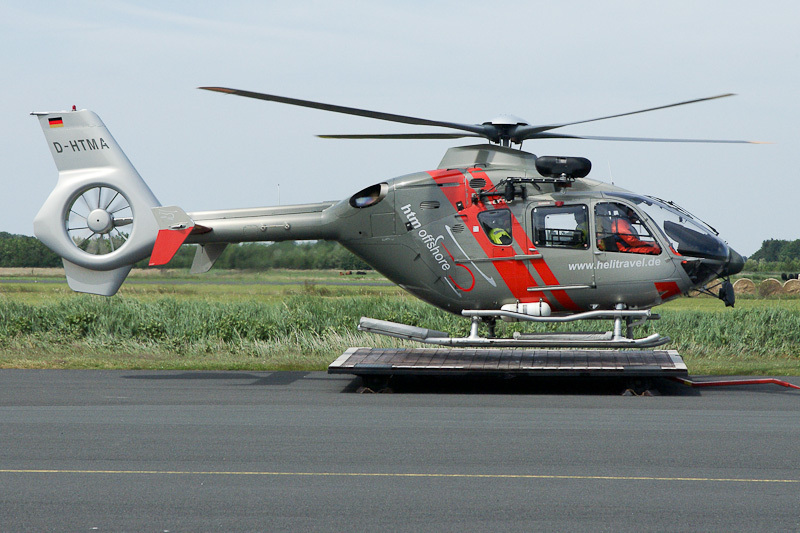 On 25 March 2009, the EC135 P2+ was registered D-HTMA in Germany with HTM - Helicopter Travel Munich. The aircraft is operated by htm offshore on flights from and to Emden to transport people and equipment to one of the offshore windfarms in the North Sea, north of Borkum Island. For this work, the EC135 P2+ helicopter is equipped with emergency floats, a hoist and a cargo hook in combination with an externally mounted load mirror.